Many Canadians living in cities are paying among the highest prices in the developed world for their mobile phone service, but those subscribing to new entrants over incumbent carriers may get a break in many cases, a new study released this week by the Canadian Radio-television and Telecommunications Commission (CRTC) reveals. The ninth annual price comparison study is prepared by Nordicity Group Ltd., with data based on surveys conducted in January and February of 2016. It examines price differences across a number of different categories, including mobile wireless telephony, fixed telephony, mobile Internet, and fixed broadband Internet. Prices from major Canadian cities are compared against those in cities in the U.S., Australia, U.K., France, Italy, Germany, and Japan. So where are Canadians shelling out the most for services compared to urbanites around the world? Looking at historical trends in Canada, while the service plans for the heaviest service plans are becoming less expensive, the most basic level service plans are going up in price. 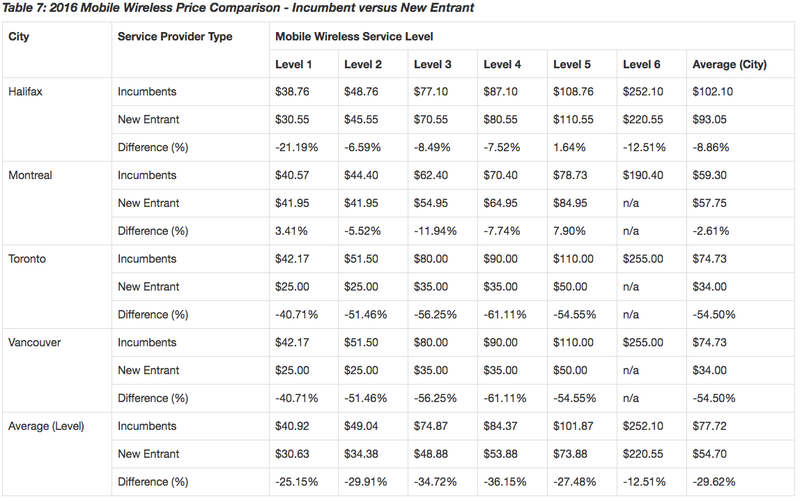 Looking at pricing trends organized by service level and city are more varied. While the most basic service level (Level 1) increased in every city since last year, there was a uniform decrease for Level 3. Higher levels saw a mix of increases and decreases depending on city. Montreal saw the best price decreases with level 5 dipping 16.1 per cent and Level 3 dipping 24.1 per cent. Because Nordicity collected its survey data from cities – Halifax, Montreal, Toronto, Winnipeg, Regina, and Vancouver – the data isn’t representative of the entire country on average. Foreign pricing information was collected from the country’s largest city.